The 1903 Kelch Bonbonnière Egg is made of gold, rose-cut diamonds, chalcedony,paillons, demantoid (green) garnets, seed pearls, translucent white enamel, velvet lining. The miniature box is made of agate, a portrait diamond, white enamel and cabochon rubies. The miniature pendant is made of gold, rose and other colored enamels. 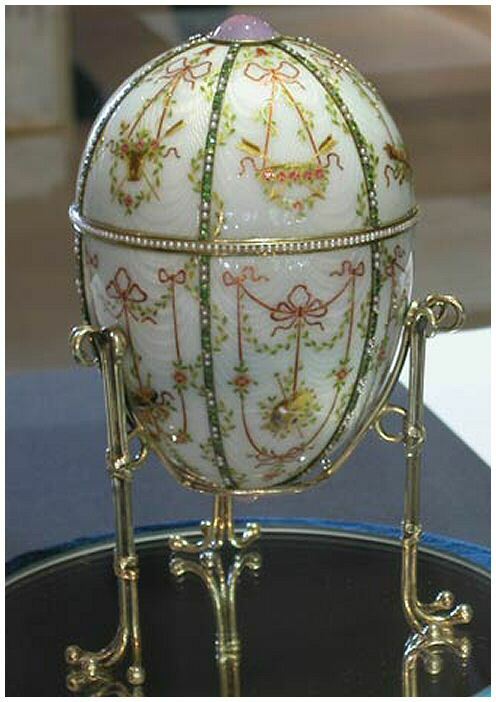 The Egg is of translucent opalescent white enamel over a moire guilloche ground, divided into twelve panels by gold bands set with alternating demantoid garnets and seed pearls; each end is set with a cabochon stone, surrounded by rose cut diamonds. The upper half is decorated with paillons in the neoclassical style. The lower half is composed of similar panels. 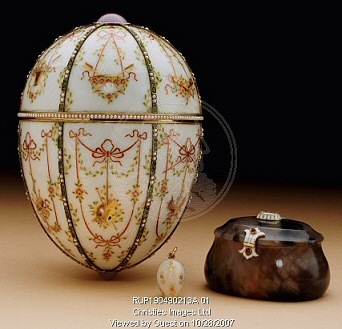 The Egg opens to reveal a fitted, velvet-lined compartment containing an oval agate bonbonnière box, the cover applied with a rectangular portrait cut diamond over the enameled date 1903. The box contains a compartment, enclosing a miniature gold mounted egg pendant. Picture above the Bonbonnière Egg with agate box dated 1903. Photo © Christie's Images. Although this egg is unmarked, it is almost certainly the work of Mikhail Perkhin, given its remarkable similarity to the 1901 Gatchina Palace Egg he created for the Dowager Empress Marie Feodorovna. 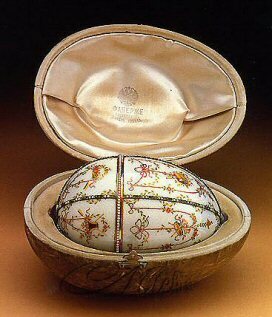 Since Perkhin died the same year the bonbonnière Egg was presented, 1903, it is believed that his successor opted not to sign the work. 1920 one of the six Kelch Eggs sold by Morgan, Paris, to A La Vieille Russie Paris. 1928 sold by A La Vieille Russie to a US buyer. 1928-1990 private collection United States. 1990 offered by Christie's, New York, from a private US collection but passed. Sold immediately after to Australian media billionaire Kerry Packer. December 27, 2005 Estate of the late Kerry Packer.